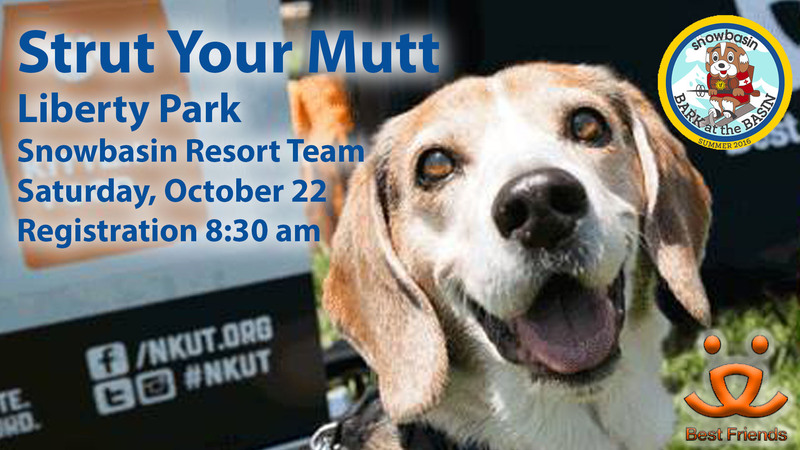 Join the Snowbasin Resort team as we raise money for Best Friends Animal Society - Utah Strut Your Mutt event on Saturday, October 22. Bring your best friend out for a leisurely 1.5-mile walk around Liberty Park and meet other pet loving people. The registration fee is tax deductible and includes a schwag bag. If you join our team, you will get a second schwag bag with goodies from our earlier event Bark in the Basin we hosted up at Snowbasin Resort. We will be donating the $2,394.06 we raised at Bark in the Basin earlier this summer as well as all the money from joining our team. Animal lovers of all kinds are welcome! Also, wear your Bark in the Basin t-shirt if you have one. Register here.